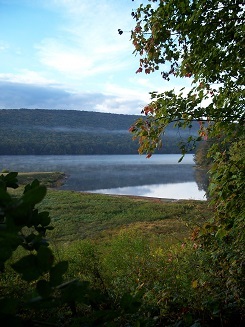 The Mauch Chunk Lake Park (a/k/a watershed a/k/a dam) holds a special place in my heart. Over the years, it has taught me so much. Its initial creation in the 1970’s to prevent flooding in the parts of Jim Thorpe downstream taught me about the harnessing and power of water. What was once a creek was transformed into a recreational haven. For me, the watershed has become a sanctuary. The trails leading to and around it have become places to walk, hike, bike and cross country ski. These activities in nature’s sanctuary helped me to expand my awareness to the many creatures and plants that live with us, right in our own back yards. It opened my eyes to a world beyond the narrow vision of my everyday realities. Even at this older age, I’m still learning from nature. I joined my sister Suzi and niece Tonia for my first-ever kayak adventure on the lake. I’ve wanted to do it for years but always had a reason to procrastinate. Suzi and I rented kayaks from Boat Launch A while Tonia brought her kayak. What a trip!! Yes, I learned about kayaking — a too-small oar and I can go sideways better than I can straight! I was also reminded of how great it feels to spend time with family, doing something together for no special reason and leaving the rat race for a few hours for solitude, fellowship and friendship. Priceless!! Why don’t we do that more often? After the initial adjustments correcting a laid-back seat and my sideways progress, I learned about a peace on the water not possible from the sidelines. Fish would grab a bite from the surface, making a unique gulping sound and leaving behind only expanding and disappearing circular ripples in the water. The huge bald eagle flying overhead and perching on a tree on the other side of the lake brought a feeling of awe and freedom for such beauty and elegance. Of course, my camera was dry in my car! On the return trip back to the boat launch, going with the flow of the current became an easier motion. I was enjoying the rhythm (at times) and conscious of what seemed to be not moving while moving, going with the flow. The most valuable lesson I re-learned was that nature is what it is, and so are we. It doesn’t try to be, have or do anything that it isn’t. What a lesson to learn! What a lesson to live by! This entry was posted in Inspiration, Nature, Spiritual Living and tagged MCLP, Nature, Outdoors, Spiritual living. Bookmark the permalink. Who knows, maybe you will have your kayak by then!! !